Rotterdam Square Mall -- where you can pay your respects on the way to Macy's. Sure, some shopping malls can be compared to graveyards (insert Latham Circle Mall joke here), but one local mall actually contains a graveyard. Brings new meaning to "shop 'til you drop." 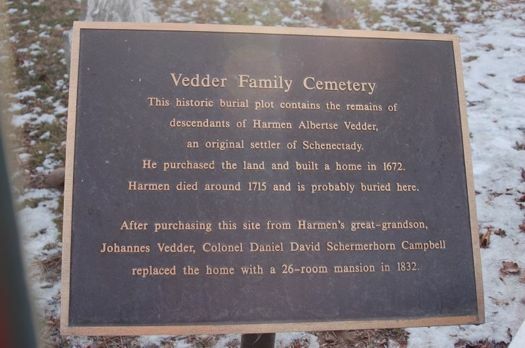 Not only is Rotterdam Square Mall the home of Macy's and T.J.Maxx, it's also the final resting place for several members of the Vedder family, Dutch pioneers who had inhabited Schenectady County since the late 1600s. So how does a mall get built around a graveyard? The story behind the cemetery in the Rotterdam Square mall structure is a gripping tale of drinking water, business interests, human remains, and a 10-year struggle with ticked-off citizens. Rotterdam Square is situated on the site once owned by Harman Albertse Vedder, one of the original settlers of Schenectady, who built a home on the land in 1672. The Vedder family lived on the land until 1832, when Harman's great-grandson Johannes sold it to Colonel Daniel David Schermerhorn Campbell. 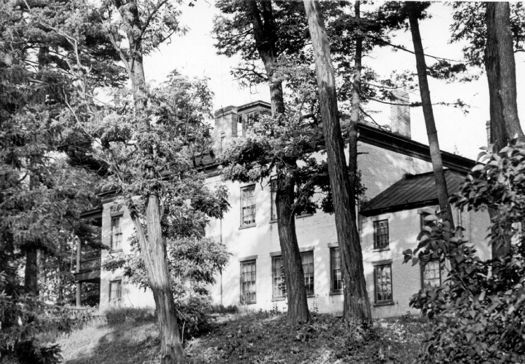 Campbell constructed a 26-bedroom mansion on the site, which stood proudly as a beacon of history for more than 150 years (it was also the first residence in Schenectady to have a telephone, which was connected to the police department). But today, where long stood a stately 19th century mansion, now stands a food court parking lot. In 1974, the Wilmorite Corporation (owners of the former Mohawk Mall in Niskayuna) were looking for a site in Rotterdam to put a new shopping center. In 1977, they made a formal proposal to the Town of Rotterdam and asked for a zoning change. In May of 1977, the Daily Gazette reported that if approved, the mall would be open by Christmas of 1979. Try 1988. Local environmentalists were opposed to the mall because the proposed site sat atop the Great Flats Aquifer, which supplies drinking water to nearly 150,000 residents of Schenectady and Saratoga counties. Also, a new mall did not sit well with business owners and elected officials in neighboring Schenectady, who were convinced that it would hurt downtown business. And then there were the Rotterdam residents who didn't like the thought of a shopping center disturbing their pastoral countryside. But Wilmorite was a tenacious corporation. There was a LOT of time spent in court. There were endless restraining orders and injunctions, claiming harm to water, wildlife and wetlands. Wilmorite persevered, and prevailed against every roadblock thrown in their path. Eventually the DEC ruled that the mall would not be harmful, and Wilmorite agreed to all kinds of safeguards for the water. So opponents found another reason to stop construction: the mall would displace an ancient family cemetery. 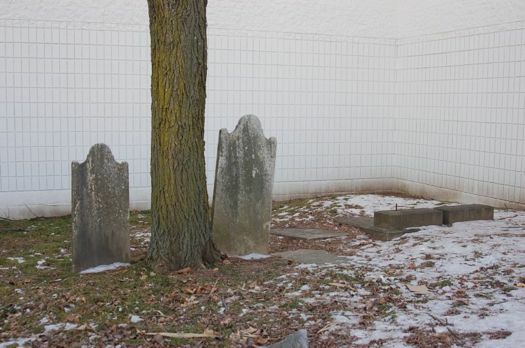 The abandoned cemetery contains 13 identifiable headstones dating from between 1793 and 1829. It became a bone of contention when several Rotterdam mall opponents asked the town to have it declared a state historic site. The town declined. 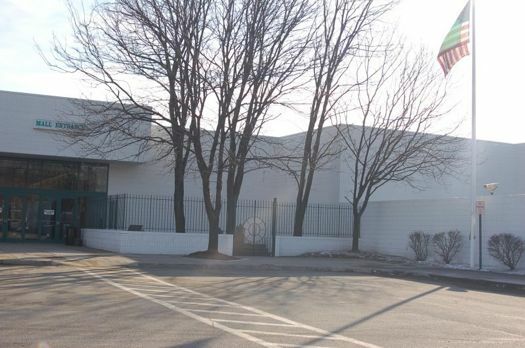 The state later decided the plot did not qualify for protection as a historic landmark anyway. Wilmorite was given the OK to relocate the remains in the cemetery and move ahead with the mall plans. But after more complaining, Wilmorite finally just threw up its hands and decided it would be easier to leave the cemetery alone. They just built the mall AROUND THE CEMETERY. "There is a little-understood court procedure for relocating cemeteries, and we were prepared to go ahead with it," said Wilmorite vice president Alfred Friedrich in the Gazette in 1983. "But we're in a situation where people are not interested in solutions. We decided it would be much easier to leave the cemetery where it is and build around it." The final mall plans included brick walls on three sides and a wrought-iron fence with a gate on the fourth side, giving access to Vedder descendants. Demolition of the Campbell Mansion took place in July of 1986, and the mall was opened in 1988. The cemetery sits just outside the entrance to Macy's. You can see two well-preserved upright headstones, as well as other flat stones. I don't know if any Vedder descendants actually visit the cemetery, but I do personally know people who, to this day, will not set foot inside Rotterdam Square Mall because of the ugly battle. Wendy Voelker muses about all things yummy at Wendalicious. She doesn't have an unhealthy obsession with graveyards and ghosts. It just seems that way. @ Carl -- I won't comment at Flickr due to previous spam problems from Yahoo related sites, but I'm also a Vedder descendant from the family branch that wound up down in Cairo, NY. Sometime back in the late 1980s I was loaned a hardbound book on Vedder family history by a distant cousin who I've since lost track of. The book had been put together back in the 1950s (I think) by some Vedder descendants who met at family reunions. I don't remember any mentions of a Mohawk wife in that. Seems to me there ought to be a copy of that book somewhere around Schenectady. Maybe Don Rittner, the Schenectady County historian, could help locate a copy. Good suggestion, I'll direct the inquisitor to Don Rittner and the SCHS. I have serious doubts about the Mohawk bride story, that's not the kind of thing that would have flown under the radar. @Carl - give a call to the Schenectady County Historical Society. They have tons of volunteers who can help track down the book for you. Their number is 518-374-0263. The photo of the Campbell Mansion was provided by them, and they published a book about Rotterdam a few years back. I have a copy of the book written byEdwin Henry Vedder "The Vedder Family in America" His widow and son have copies on hand. What has become of the Carousel? Wilmorite was relentless in their pursuit of that property and destroyed an amazing forest and ancient creek in the process; thank god people like Dr. Vincent Schaeffer and Ms. Jean Tomlinson who fought their best against the corporate interests. Sadly, other projects across the street from the mall (BJ's) destroyed a historic YMCA camp and further threatened the valuable watershed that The Great Flats is today. I am a descendant of the Vedder(Vader) family and would like to buy or borrow a copy of "The Vedder Family in America, 1657-1985. If anyone knows I would appreciate it very much. Did you get a copy of the Vedder book? I have one but don't want to loan it out. All the information in it is online at rootsweb. I am a Vedder decedent and I have visited the cemetery, they opened the gate for me. I am a descendant also. On my mother's side. A friend says her daughter works at Spencer's in rhe mall and that a little boy haunts the mall & cemetery. I was wondering if any of you know if any Vedders were buried there at a young age. And yes, Eddie Vedder is a descendant (he took his mother's surname) and the artist Elihu Vedder. I have done a DNA test and have no native American blood so I cannot assume to be a descendant of a Mohawk woman but of the union(s) with Dutch wives. I think it's disgusting how the state was going to allow the graves to be dug up. Let people be and rest in peace. Even tho they weren;t moved, I still think it's horrible they built a mall around the cemetary. I will never set foot in that place because of this.